A tweet disseminated by Bloomberg writer Mark Gurman, gives us some insight into 2019's iOS 13. 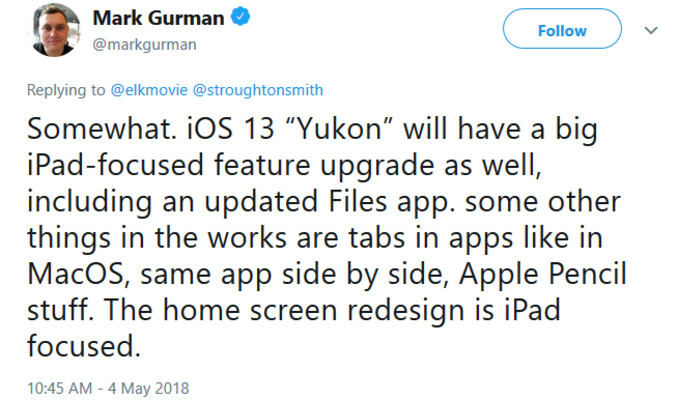 According to Gurman, next year's iOS update comes with an exclusive update for the Apple iPad that has a codename of "Yukon." The home screen for the tablet will be redesigned, and an updated Files app will be included. 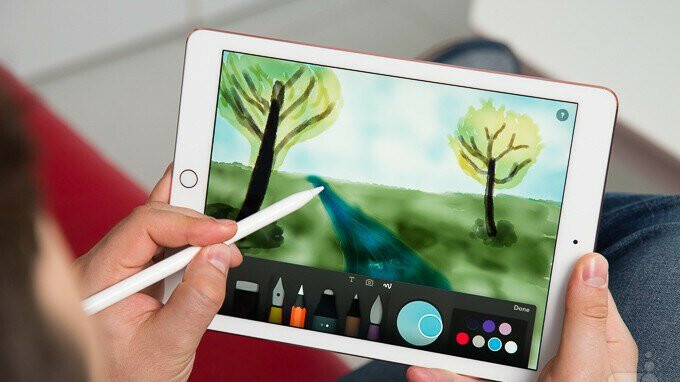 Some of the updated features will be for the Apple Pencil. If Gurman is correct, Apple will add in-app tabs, currently used on MacOS, and users will be able to call up side-by-side screens of the same app in Split View. In response to a tweeted response, Gurman did say that the iPhone will get some of the Springboard redesign that the iPad is getting. Some rumors indicate that some of next year's "Yukon" feature set was to be included in this year's iOS 12. Apple reportedly decided to focus instead on improving performance and security with this year's new iOS build. We will see iOS 12 introduced next month at WWDC 2018. The annual developers conference will run from June 4th through June 8th at the McEnery Convention Center in San Jose, California. I don't know why they don't improve the software of iPhone and most of new features for iPad only ! It's easy. They want something left for people to still buy iPads. Could you image an iPhone with tablet, or phablet like functionality. Apples iPhone plus models are phablet in name only. No real multitasking or split screen multitasking. No pen support, or any other tablet features. But this is Apple for you. People should already know how Apple controls everything. If Apple did support all those features on a larger iPhone, then you would see iPad sales plummet. Yes maybe that's right! Because of iOS and some stupid things in iPhoneX, I left iPhone and moved to Samsung Note 8 ! I enjoy my iPhone X. I have had a note and as a phone I don’t use the pen that much or split screen. Really Apple ever since the first iPhone made it so you don’t need a stylus to use it like my windows mobile phones. I don’t see a need to have a pen except for the niche few. It would be cool for coloring or editing photos but I can care less about the stylus on my phone. I rarely even use my stylus pen for my Windows computer tablet. Yes, I agree. stylus is mostly a gimmick. Besides the screen on the note is too small to comfortably write anything. It's like fiddling around. A real pad with a pen is simply better and it only costs a few cents. If someone is taking lots of notes an iPad 2018 with Apple Pencil or equivalent would make more sense and it's way, way cheaper than Note 8. No, they won't, because only dumb people would chose to do tablet tasks on a small smartphone display and Apple's users are not as dumb as you think they are. Apparently Apple disagrees, rumor has it they plan on making a iPhone phablet that comes with a stylus and Note like functionality. Would that make Apple dumb according to you then, or is it innovation and how did you ever do without, suddenly. Only apparently. I don't buy s**t, because it's made by Apple; I buy Apple, because it is suitable for my s**t. For me the tablet is an anomaly; I'm OK with the pro - for drawing stuff, education purposes, light office and stuff like that - although I went for a ultrabook (connected to a normal sized display, when I'm stationary) to do those things, but I will never get the purpose of a 7-10" tablet that copies the phone functions without its portability and celular capabilities. I hope Apple doesn't decide to go full throttle on features. I like simplicity. Apple's reoccurring pattern each year, release iOS, release new iPhones, new iOS diminishes performance on older models noticably and Apple denies or blames new features, iPhone users buy new iPhone, after a month or two Apple's subsequent iOS updates gradually bring slight performance tweaks for older models for those who are unlikely to upgrade. My experience with major Android updates has always been the opposite. On my old Xperia Z1, going from Jelly Bean, to KitKat and then Lollipop, they all improved performance noticably, hell benchmarks even confirmed increased performance. So why is it that Apple can't do the same? The answer is dead simple, they don't want to, it f**ks up their business model of a 1 year iPhone lifespan. In court they've even claimed iPhones are only meant to survive one year. Yup I agree with notification part of iOS as it is full messed up compared to Android. New UI Apple...please. Also bring split view picture in picture, multitasking dock, pencil support, and a form of screen off memo to the iPhone. The iPhone is a great device, but it could use the proverbial “shot in the arm”. I’m all in with buying the 6.5 inch X Plus, but give it lotsa features that take full advantage of the large canvas. You won't get it soon enough,keep dreaming,Only a new UI will be sufficient for u,apple will do what its right for their user according to their decision,feeling depending on their financial situation and self ego.u can't please them.until then stay with Galaxy Note.This is apple for u.Switch to windows,mac os if want to do some real intensive multitasking work. Not only do you post the most stupid stuff, you construct content, like a 4 yr old. I think I know who you are. People say he is Bankz. Could be, but could be Arte. I’ve never known you to be grammatically retarded like his posts are. And the only conclusion is that you don't know s**t about iOS. Pretty much this.. IOS has now become a basic operating system for their phones now. I need an android phone with the Iphone X design and the Huawei p20 pro's tripple camera syatem and with Googles software with huawei P20 pros battery life and with an OLED screen and samsung features.. Now, this is my ideal phone. but Alas, I can only dream. iOS has always been a basic operating system; that is the reason Apple invented... the store: so that users enhance and personalize their experience by installing the apps they need. You still can personalize your experience on iOS by installing apps the same way you can on Android. So mentioning it quite pointless. iOS has a clear disadvantage against Android when it comes to enhancing and personalizing user experience with 3rd party apps. I don't remember saying a damn thing about Android; A. may be the best OS ever built - that's not the point and I have no interest of talking about it on a article ABOUT iOS!!! Now, can you please get back on the subject? Yes. I know PA. Already heard this news. Keep trying though. Maybe you will do better.